Today Huawei has made a new smartphone official in Italy. It's called G Play Mini for whatever reason, and it's already available to purchase for €229 ($254) without a carrier contract. The Huawei G Play Mini is rather intriguing, because it has the exact same specs as the Honor 4C which got official in China yesterday, but the design is slightly different. This is most obvious in the upper part of the front side of the two devices. Why the company chose to pair the internals of the Honor 4C with another design and name instead of simply releasing that in Italy is still a mystery. 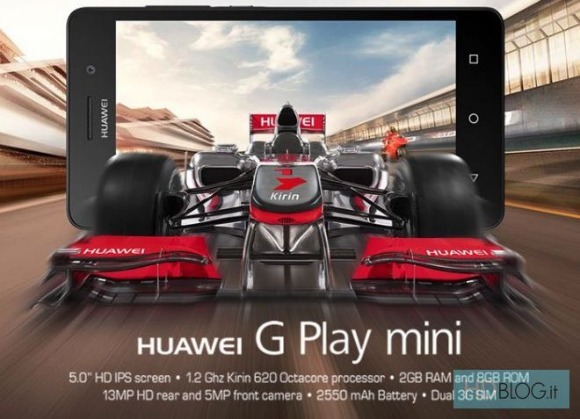 Anyway, if you're interested in the Huawei G Play Mini, know that it has a 5-inch 720p IPS touchscreen, a 13 MP rear camera with LED flash, a 5 MP selfie snapper, 2GB of RAM, 8GB of expandable internal storage, and a 2,550 mAh battery. It's powered by the HiSilicon Kirin 620 chipset, which sports a 1.2 GHz octa-core CPU, and it has dual-SIM support (though no 4G LTE). The G Play Mini could be making it to other European countries soon, now that it's gone official in Italy, but there's no information about time frames yet.